A stunning complement to any bedside, our Siesta Mission Nightstand offers versatility, functionality, and a lifetime of quality that you can hand down for generations to come. 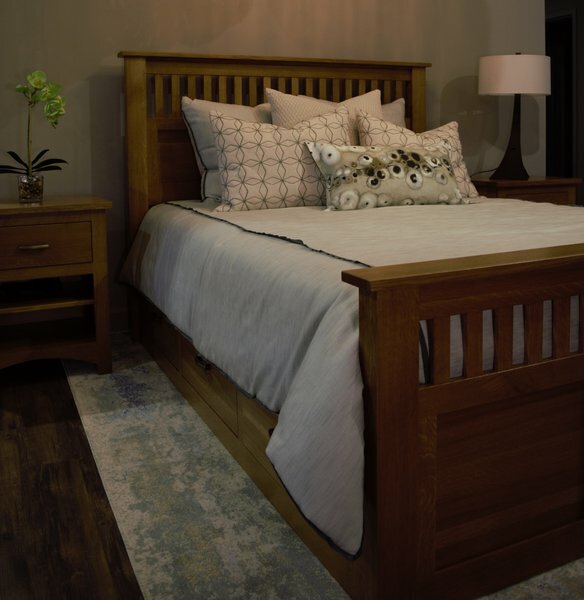 Crafted by the skilled hands of Amish woodworkers, the Siesta Nightstand is styled after the timeless Mission look, complete with flat front sides, a flush-mounted drawer in front, and graceful curves that outline the square l-shaped feet - allowing the natural grain patterns in the hardwood to offer all the detail. Inside the deep drawer, you'll find a high-quality dovetailed drawer box, fixed to the case with your choice of side-mounted full-extension glides, or soft-close undermounted glides, offering a range of different options for accessing your most-important bedtime necessities. Below, an open space is divided evenly with a solid wood shelf, allowing you the versatility to store books, magazines, or any other items you may need to make your rest as enjoyable as possible. Shown in a classic Quarter Sawn Oak with Michael's Cherry stain, choose this combination to get the classic look, or pick the perfect wood and finish combination to complement your space. We can also customize this piece to fit your exact specifications. Please call for a free custom quote.